Google is nowadays the most widely used search engine on the planet. A lot of people use it and are satisfied by its performances. However, Google suffers from several drawbacks. For example, a lot of results are redundant. It sometimes happens that Google gives you too much answers. Assume that you have an information on a .pdf file linked from a specific webpage itself belonging to an overall website. Google will perhaps give you three different links (the main website, the specific webpage and the .pdf file itself). Another drawback of Google (and many other free-text search engine) is the lack of structure among results. Information is given in a raw manner, without themes, hierarchies or categories. So, it often happens to be drowned under the information obtained. 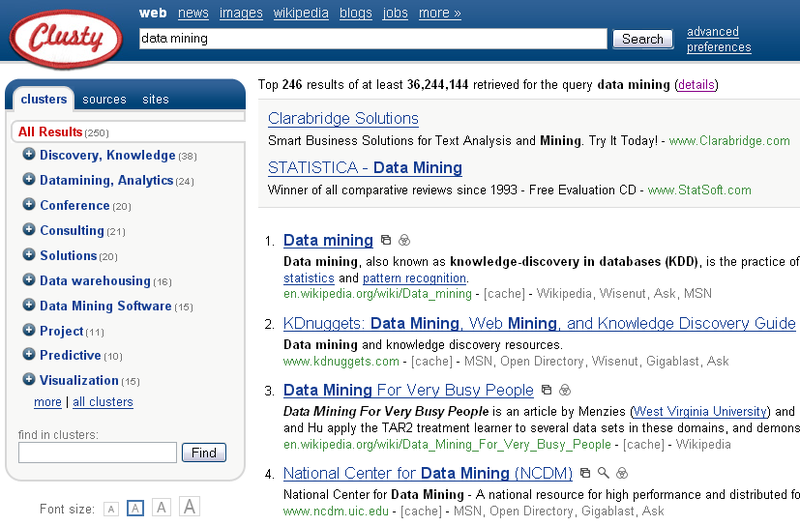 A search on the term data mining, for example, results in 52,600,000 hits. Clusty, a recent search engine (Pittsburgh, 2004), is a good alternative to Google. Clusty is a meta search engine, which means it queries top search engines and combines the results for the user. Clusty use clustering techniques to group results into categories. The results are automatically clustered according to selected key-words. 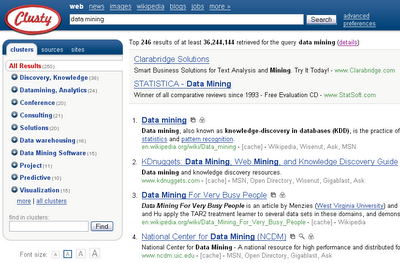 For the example of the term data mining, Clusty proposes 246 results that are part of 36,244,144 hits found. The figure below shows the results obtained. Clusty proposes clusters and sub-clusters that can be browsed (left part of the figure). Information is not raw as in Google, but rather organized. Up to now, the only drawback I have noticed regarding Clusty is about ads. They are to close to the results obtained and this sometimes induce confusion to the user. your article on search engine made me think abt the future of search engines .. i end up writing abt future search engine in my blog. I am not very much satisfied with the results of clusty but it is a good start to begin with. Yes, that was definitely true, google is widely used along the world and used as an avenue for references and resources. This is only reason on the existence of Search Engine Optimization. Web mining on the other hand is the application that uses data mining and designed to analyze and discover patterns from the web.